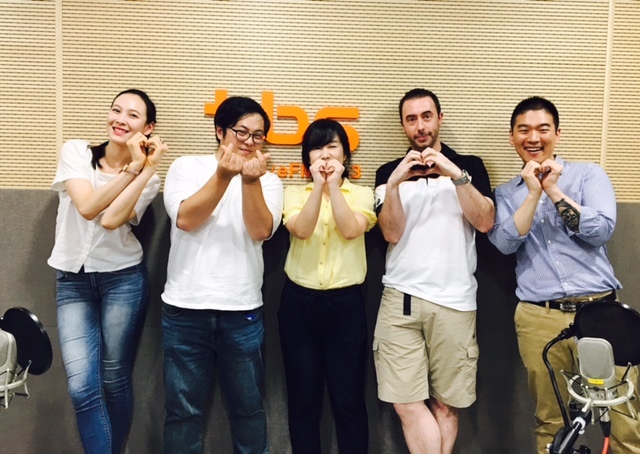 Shin Han, CEO of WEDIT, had an interview on <A Little Of A Lot>, one of the famous English radio shows in Korea. Shin, Becky and other panels had a enjoyable time talking about weddings. Many people congratulated famous celebrities Song Joong-ki and Song Hye-gyo;s wedding announcement earlier in the week. Meanwhile, singer Lee Hyo-ri revealed how her suppossedly ‘small’ wedding was in fact very costly. Wedding culture has been changing in recent years. What are some of the wedding traditions that have survived? How ‘small’ are ‘small’ weddings? “How would you define a ‘small wedding’? Becky : Yes we’re talking about wedding today here <A Little of A Lot>. We’re going to start on our second conversation as we are joined in the studio by Mr. Shin Han. He is the CEO of WEDIT which is a small wedding service company here in Korea. He held a small wedding three years ago himself and made all the preparation himself. And actually his beautiful wife penny is here in the studio with us showing her supports. Anyway Shin he decided to found a company to help more couples with this process because small wedding is not a very popular theme in Korea right? Shin : Yes it is. Becky : So that was what inspired you to create this company. What is your experience then so far? Shin : Well.. It’s hard to start a company. And since small wedding is not a big thing right now but it’s coming really big nowadays. So at the beginning it was like three years ago and it was really hard but nowadays a lot of people know the concept and they want to do it a lot. So now we’re getting really nice reactions from our customers. So business is good. David : How would you describe what a small wedding is compare to just regular wedding? Shin : Well. Basically you can just think of it as like a more westernized wedding. So something that is not a wedding-hall wedding. Have you guys ever been to like a Korean-wedding? (So many) it’s all the same, right? All same factory-made wedding. I personally think small wedding is something not a wedding hall wedding. But the word ‘small’ makes it much more controversial. Is it budget small? Or guest small? But what I think it’s a wedding that’s more diverse and has much more meaning into it. And you can spend more time with your family, relatives and loved ones. Shin : Yes I think wedding should be more diverse and meaningful. But what is now in korea right now it’s something that people don’t want. It’s like a factory made kind of wedding .so some people want to find some alternatives. So we provide that kind of service at our website. David : (Describe what a Korean wedding-hall is) It’s a giant building and they have several rooms and then as it’s the wedding that only takes one hour in total maybe? Even less then that, the ceremony takes 30mins. But everything’s prepared the flowers, the photographer, you have everybody come in. They read something for 30mins. They vow to their parents and they go right to the buffet. And literally you’ll have like maybe in a day 50 going on and just rotating around. So it’s very interesting to go. Becky : Small weddings. The term small weddings was first coined after Lee HyoRi’s wedding in Jeju island? Shin : Yeah actually like celebrities, for example Lee HyoRi, Wonbin or Lee NaYoung made it much more trendy and popular. I think they contributed a lot and after that the term small wedding was used a lot in newspapers, media. But I personally don’t think it describes at all. Becky : Yeah Right. I think you are not the only one to say that. Anyway we had a TV show where Lee Hyori came out and she was talking about her small wedding. I put quotation mark because she actually said it wasn’t small and she would actually call ULTRA LUXURY wedding. And doing it by yourself requires a lot of money, a lot of time. So I don’t know if the word small wedding is really the right time. Shin : Yeah like it’s been still controversial. And people don’t want to think… some people want to think small wedding is low cost, budget-less, you know, getting rid of stuff. I agree with that in one point but in one point it’s like doing what you guys want. What the bride and groom want. It I want it to be special, I can spend money to make it special so it’s very long range, from cheap to expensive, luxurious to very homy. David : So it’s more personalized and individualized. If Lee Hyori is marrying Lee Sangsoon in Jeju, they can do it how they want. In the west we also have traditional weddings, like in a church, but they have also changed. You said about it was about three years that these small weddings have come in. Any idea of when it might have started changing elsewhere? Well basically in our company we have 2 parts, Offline and Online. We provide venues and vendors online so You can just take whatever you want. But the other thing, what we do offline, is we meet the bride and groom and make their dreams come true. It was this June, just a month ago. And the bride and groom were surfer. They really love to surf, camp and they are very outdoor people. So we talked about concept. We had a big surf board at the wedding venue. And they had fashion show kind of things. People stand up and they had a wall behind them. People kinda like pose like a fashion models and had fun with it. Amos : Hawaian shirts. And flower garlands and all these things. Becky : Do you usually have any particular location where you hold these weddings? Shin :Oh Yeah so. The term I told you ‘no wedding-hall wedding’. You can do anywhere. That’s what we think. So mostly we do it in restaurants, because they do caterings. David : Wedding is very stressful. Not just for the ceremony itself but the whole preparation. And conquers on a lot of controversies and arguments about what flowers you might have and you know the music… How would you suggest people to survive this process? Shin : As you said there’re so many things to choose and so many things to talk about. And you know, it’s inevitable. I think the basic thing right now in Korea is wedding is like buying things, purchasing things. So it’s about the money so why did you buy such an expensive package? So that could be the main thing. But I really want the bride and groom the change their concept as wedding preparation is a project. So it’s like working together. If you get married, well it’s romantic but in some way it’s like working. You have to do dishes and everything. So it’s like Preparing for that.so Learn how other person work. See their work style and you have to adjust to it. So it could be stressful but it could be. Learning a lot from the process. So think of other people you work with,. You don’t yell at them, right? So you have to try to understand and to talk with him. So think of it not something you purchase but a project. You can listen to the rest of the interview at Youtube! It was very lucky of WEDIT to visit the studio and talk about small wedding culture in Korea. And if you wonder what WEDIT is for, come check our website here.